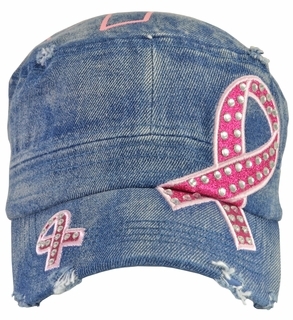 Our Breast Cancer Hope denim hat is a great way to show and to ask others for awareness of the risks and suffering inherent to the disease Breast Cancer that effects so many people. Large and small pink awareness ribbons are embroidered on the front and festooned with rhinestones. On the top of the hat is a third printed ribbon. The hat is a groovy boxy style and is slightly fashion distressed. This hat is one size fits all, has an adjustable matching denim back-strap and is 100% cotton.